Dallas is a sprawling modern city in the southern US state of Texas. This metropolitan destination boasts a melting pot of cultures from all over the world, a growing music scene, thriving nightlife, fine-dining restaurants galore, lush parks and gardens, high-end shopping streets and hip neighbourhoods. Dallas is home to one of the world’s largest economies and it’s one of the fastest growing cities in America, which really shows with its towering skyline of modern skyscrapers. The famed Reunion Tower stands out amongst Dallas’ skyline which has a panoramic observation deck, as well as the the Bank of America Plaza, which is the city’s tallest building that illuminates with green coloured LED lights in the evenings. Dallas also has many historic sites and architectural wonders featuring Gothic, Victorian and Neoclassical styles, creating a wonderful blend of past and present. The city’s Pioneer Plaza is a significant historic attraction worth visiting which commemorates the city’s past with a re-creation of the city’s 19th century Shawnee Trail cattle driving route, featuring bronze sculptures of Texas Longhorn cattle. Brightsun Travel offers an extensive range of discount airfares to Dallas, taking you to the heart of this historic city. Dallas is a very creative city with an impressive selection of art institutions and cultural museums. Start at the Dallas Art’s District, which is where the city’s finest museums and galleries are set. This is the largest urban arts district in America, home to the Dallas Museum which contains a collection of over 24,000 local and international artworks, and the Nasher Sculpture Centre, displaying one of world’s finest collections of contemporary sculptures, with masterpieces by famous artists including Rodin and Picasso. The Sixth Floor Museum is another must-visit venue that’s dedicated to John F Kennedy, the former president of the US with interesting exhibits, programmes, films and artifacts. Then there’s the Perot Museum of Nature and Science, an architectural masterpiece and family-fun attraction with a host of activities, interactive exhibits, an earthquake simulator and life sized dinosaur fossil skeletons. 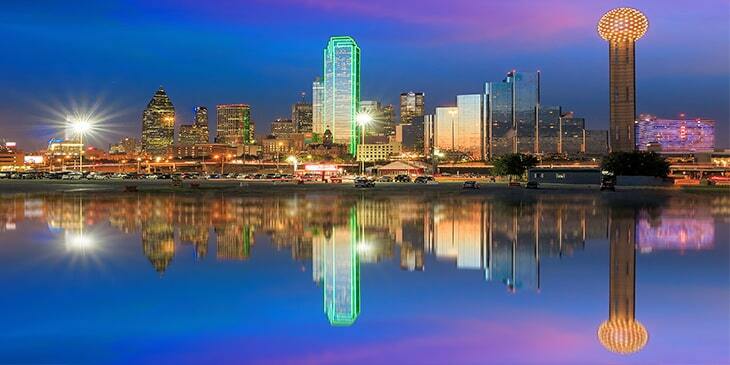 Book cheap tickets to Dallas with Brightsun and prepare for the ultimate getaway to this dazzling city. Why not visit during the State Fair of Texas? This phenomenal cultural event happens every year during the city’s fall season, attracting millions of visitors with amusement rides, live performances, sports events, drinking holes, agriculture exhibits and more.